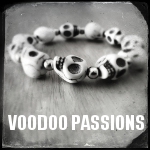 Love everything voodoo and spiritual. Does anthralaska belong in this group? Practitioner of Ocha and Palo Yah, I'm a white girl. I take this very seriously and how I came here is a long story. I have been practicing Ocha (Santeria) for over 15 years now and have been initiated into Voodoo. Does redduchess999 belong in this group? Does flashsquared belong in this group?